Share Logistics: Remember to exchange your empty share box for the full one on your assigned pick up date. Anticipated Harvest: Head lettuce, spring mix, kale, rainbow chard, dill, cilantro, kohlrabi and new this week – basil! Green juice – kale, lemon and apples, kohlrabi slaw, scrambled eggs with finely chopped chard/kale, tuna salad with dill, kohlrabi slaw with finely chopped chard, and pumpkin seeds, quinoa with greens, salads, sandwiches, wraps, quesadillas with veggies, basil lemonade, and cilantro lime rice. 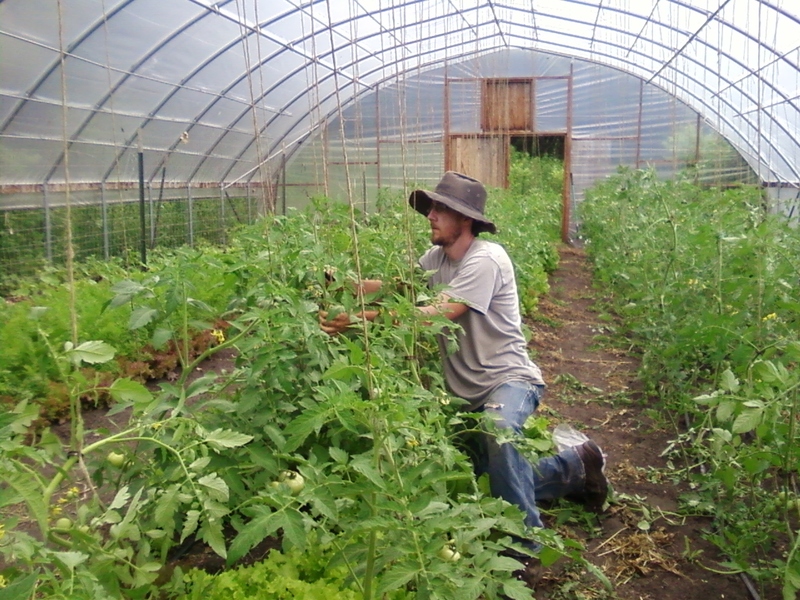 Farmer Adam trellising tomatoes in the high tunnel, photo taken June 21st – Happy Solstice!!! This is the first share box for “even week” half share members! Happy Soltice (yesterday) – summer is officially here and the heat yesterday was definitely felt while working in the field. Happenings on the farm… our farm cat had four kittens on Tuesday and they seem to be adapting well. The second fence is about 90% complete and will keep the deer out from feasting in the back field. We have been busy weeding and weeding more to keep up with the thistle. Remember to exchange your empty share box for the full one on your assigned pick up date. Should you have any questions and send a text to (507)720-5364 (include your name). At each pick-up site there will be an “EXTRAS BOX – TAKE or TRADE” feel free to take produce left in the extras box or trade produce if you choose to. Rinse the greens as you use them. Store is an airtight container of your choice. The salad mix and spinach will keep in the bag provided. Remove the green tops from the radishes and kohlrabi prior to storing them. Make yourself fresh salads, sandwiches or wraps. Kohlrabi and radish coleslaw, cilantro radish curried albacore tuna salad, scrambled eggs with finely chopped spinach, Rice served on a bed of finely chopped de-stemmed chard or kale. 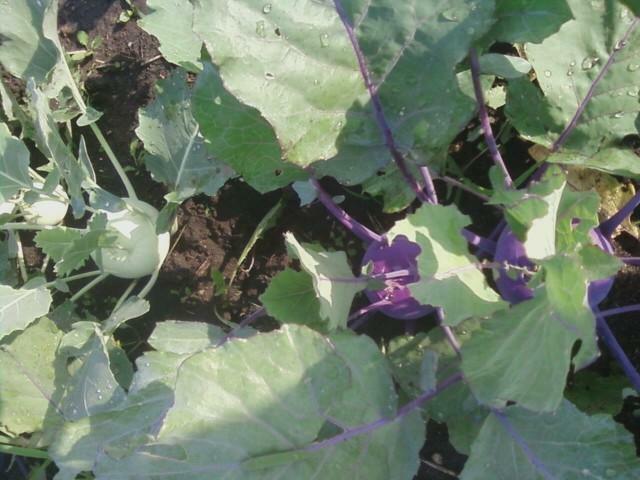 Kohlrabi – purple or green bulbs- can be eaten raw, (grated in coleslaw or salad), pickled or cooked. This is the first share box for full share members and “odd week” half share members. 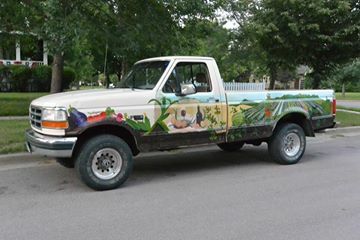 The weekly news will be posted to the farm website www.livinglandfarm.com and quick updates to Facebook – so be sure to like us. The newsletter will include a brief update on happenings on the farm and the anticipated harvest. 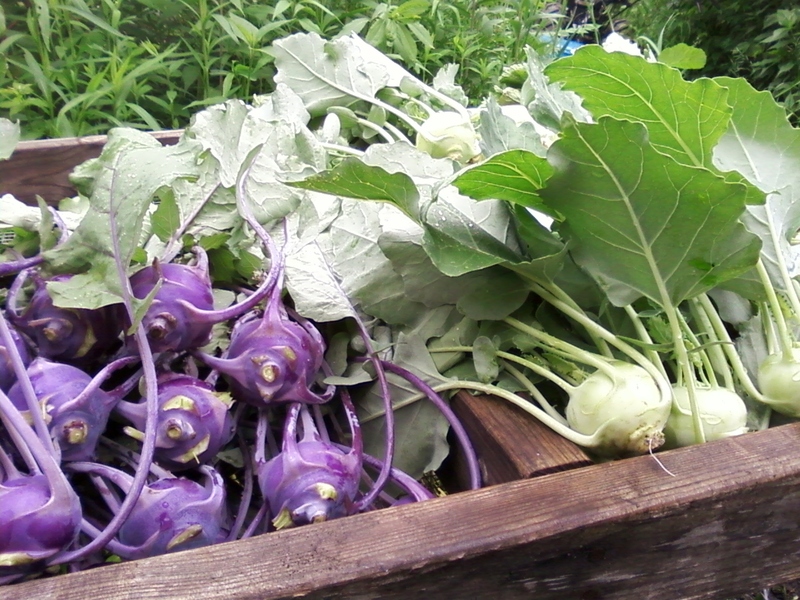 If you will be using the radishes and kohlrabi several days after delivery remove the tops prior to storing them. The herbs can be stored with stems in an inch of water in the fridge or on your countertop at room temperature. Or without water in a container of your choice in the fridge. Make yourself fresh salads, sandwiches or wraps and enjoy the fresh produce!